Slobodan Milosevic was the President of Serbia from 1989 to 1997 and President of the Federal Republic of Yugoslavia from 1997 to 2000. Yugoslavia was established in 1918 and in 1946 after World War II it was renamed the Federal People’s Republic of Yugoslavia under communist rule of Josip Broz Tito who ruled the country as President until his death in 1980. The six Socialist Republics that made up Yugoslavia were Bosnia and Herzegovina, Croatia, Macedoni a, Montenegro, Slovenia and Serbia. Serbia had two autonomous provinces, Vojvodina and Kosovo. After the death of Tito there was instability in the country due to an economic and political crisis paving the way break-up of Yugoslavia leading to the Yugoslav wars. Stambolic later said that he had seen that day as “the end of Yugoslavia” since nationalism was identified as a violation of the Yugoslav Communists’ commitment to brotherhood and unity. Milosevic became the President of Serbia in 1989. He embraced and promoted nationalism, manipulating the grievances of Serbs. Slovenia declared independence in 1991and the Yugoslav Government declared it was illegal and there was a war lasted for 10 days initiated by Yugoslav People’s Army (JNA) against Slovenia. Croatia also declared independence in the same year and the war lasted till 1995. JNA was comprising mainly of Serbs, around 70% so that there were allegations that JNA was engaged in war crimes in favour of the minority Serbs in Croatia. The Bosnian war started in 1992 and it started as a territorial conflict between Bosnia and Herzegovina supported by Serbia and Croatia respectively. Kosovo war started in 1998 and lasted for four years. Serbian government in 1989 introduced amendments to the constitution of Serbia, Kosovo and Vojvodina in order to quash the autonomy enjoyed by Kosovo and Vojvodina. Although the ethnic majority of Kosovo were Albanians they were forced to vote in favour of the amendments by the Serb police. Irrespective of the fact that the ethnic composition of the Kosovo Assembly was over 70% Albanian, they were forced to vote in favour of the amendments by the Serbian police forces. After the autonomy of Kosovo was quashed Kosovo was faced with state organised oppression. Majority of ethnic Albanians were fired from their jobs in large numbers. With time, Kosovar Albanians started an insurgency against Serbia and the Kosovo Liberation Army was founded in 1996. Thereafter the conflict escalated. It appeared to be that Milosevic had duel objectives. One was to support the minority Serbs in other Yugoslavian states and thereby strengthen his political status in Serbia. He wanted to use the grievances of Serbs who were in the other states within Yugoslavia in order to be popular within Serbia and establish his rule. The other objective was to create a greater Serbia and by which to capture the power of entire Yugoslavia. The reason for the second objective was this. Total Serb population in the world was 10.5 m to 12.5 m out of which six million lived in Serbia; 1.3 m lived in Bosnia which was 31.2% of the Bosnian population; 581,000 lived in Croatia which was 12.2% of the Croatian population; 178,000 lived in Montenegro which was 28% Montenegrin population: 47,000 lived in Slovenia which was 2.5% of the Slovene population. Out of the eight million world population of Croatians 3.8 m lived in Croatia. Out of six to seven m Bosnian population 3.8 m lived in Bosnia. Out of 2.5 m Slovenian population 1.6 m lived there. Serbs were the majority of combined Yugoslavia and they were spread in states other than Serbia holding vital positions. Hence according to the view of Milosevic there was a possibility of capture the power of Yugoslavia by creating a greater Serbia. This could have been done by empowering minority Serbs in other Yugoslav states. Operating in this line he committed war crimes in the wars against Croatia, Bosnia and Kosovo against the respective majority ethnic groups in those states. By promoting Serb nationalism he became popular in Serbia. In fact what he did was breaking up Yugoslavia by fuelling ethnic tensions although he thought he was doing other way around. In his short sighted approach to the Yugoslav wars he has given enough ammunitions to the other states for separation. Rajapaksa on the other hand came to power in 2010 in Sri Lanka mainly from the votes of the majority Sinhala Buddhists setting aside a myth hither to believed that a candidate of a presidential election should secure the support of the minority votes in order to win. Sinhala Buddhists supported him en bloc as gratitude of winning the war. This paved the way for another myth that a presidential election can be won by simply appeasing the Sinhala Buddhists in the expense of the minorities of the country. That was the policy adapted by the Rajapaksa regime in local politics which severely affected the ethnic and religious harmony in the country. The West and India supported Rajapaksa to defeat of LTTE in the military front. Because of the naïve local policy of alienating the Tamils, Rajapaksa did not take concrete steps for reconciliation. Hence India and the West pressurised Rajapaksa for reconciliation. Elections for Northern Provincial Council was held under Indian pressure. In order to avoid this pressure Rajapaksa turned to China. This act antagonised the West as well as India. Rajapaksa then has taken an anti-West stance. This is completely the reverse of non-aligned foreign policy which is more suitable for a country like Sri Lanka and adapted by Sri Lanka. 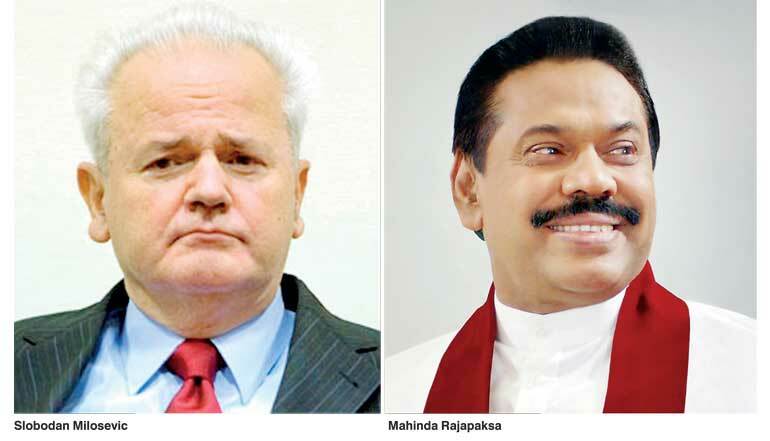 Both Rajapaksa and Milosevic designed and implemented their basic political strategies using racism in order to establish their power and win elections. They both have taken an anti-West stance in their local politics which enhanced their so called nationalist approach. They have placed their own goals ahead of the goals of their respective nations and by which act they have taken their nations to a near disaster. By the time of the death of Milosevic at his prison cell due to heart attack in March 2006, he was facing charges of war crimes at International Criminal Tribunal for Yugoslavia in Hague, Netherlands. Veteran correspondent of London Sunday Times Marie Colvin reported that LTTE leaders Nadesan and Pulidevan wanted to surrender at the last stages of war. She called the UN Secretary General’s Chief of Staff Vijay Nambiar who she said had been assured by the Sri Lankan President that Nadesan would be safe in surrendering to the Sri Lankan Army. Nambiar was in Sri Lanka at that time and Nadesan and the group were advised to hoist a white flag and they would be allowed to surrender. Subsequently, while coming through the front line hoisting a white flag, they all were killed. If the story was correct, it was a war crime under the international law. It undermined the war victory. Moreover, it was against the age-old tradition of the Sinhala warriors that they would not fight against an unarmed enemy or the enemy who wants to surrender. It went against the pride of the Sinhalese and it was completely the opposite of the way taken by Dutugemunu, the iconic Sinhala worrier and the king. Milosevic had a terrible record of political killings and suppressing media freedom. There was an attempted murder of the Opposition political figure, Vuk Draskovic. Journalist Slavko Kuruvia was murdered. There was a kidnapping and murder of the former Serbian President Ivan Stambolic. Milosevic is believed to have ordered all these killings and his police chief Markovic is thought to have organised them. In June 2006 the Supreme Court of Serbia ruled that Milosevic had ordered the murder of Stambolic. In March 1991, Serbia’s Public Prosecutor ordered a 36-hour blackout of two independent media stations, B92 Radio and Studio B television to prevent the broadcast of a demonstration against the Serbian Government taking place in Belgrade. During the Rajapaksa regime, Lasantha Wickrematunge, Editor of The Sunday Leader, was murdered in cold blood within a High Security Zone. Prageeth Ekneligoda disappeared. Several other journalists were attacked and they were forced to go abroad. The Sirasa media station was attacked. During his regime Sri Lanka became a high risk country for the journalists. This was exactly the case in Sri Lanka during the Rajapaksa regime. Non-racists and fair-thinking people were identified as traitors and they were criticised by Government ministers and also by media, both Government-owned and private-owned. It appeared to be that Rajapaksa was able to mesmerise the majority. China had good relationship with Milosevic. In 1997 Chinese President Jiang Zemin invited Milosevic to China. He was popularly known in China by the nickname ‘old Mi’. When most of the Western governments were critical of him because of his anti-humanity activities, China stood by him. China vocally opposed NATO armed intervention in Kosovo throughout the campaign. Chinese Prime Minister Li Peng was presented by Milosevic with Yugoslavia’s highest medal in Belgrade in 2000. China supported Rajapaksa whole heartedly at the resolutions against Sri Lanka at UN Human Rights Council. China together with Russia gave the comfort to Rajapaksa at UN forums. Milosevic called for early elections in 2000 anticipating that he would win the elections. However the voters elected the opposition candidate Vojislav Kostunica, a constitutional lawyer. Milosevic initially refused to concede defeat, but after nonviolent mass demonstrations demanding his resignation and the commanders of the Army indicated that they would not support him Milosevic resigned, ending his 13-year rule. Rajapaksa also called election two years earlier than the scheduled date. After losing it was reported that there was an attempt to stay in power illegally which was derailed by the senior public officers ending his nine-year rule. Both of them had corruption charges. Charges against Rajapaksa are yet to be proved. Parliament was dissolved and the general election is scheduled on 17 August. It is reported that Rajapaksa wants to come back to Parliament. Rajapaksa has taken a wrong decision by calling early presidential elections although it was favourable to the country. May be he was misled. Now he is supported by a large number of corrupt politicians who would not have any say without him. It appears to be that he is being misled in the second time in a short span of time period. He who got the same opportunity as Nelson Mandela after the end of the war lost the opportunity to retire as a graceful leader due to the Milosevic-style wrong policies adopted by him. Now he sings his swansong. In near future there is a possibility that he will be thrown into the dustbin of the history.